Costa Blanca is known as the 'White Coast' as it offers miles of fine sandy beaches and a brilliant light, dry, hot climate. The main tourist resorts here are Benidorm and Alicante, although other popular holiday destinations include Gandia with a wonderful 14th century palace, and Altea offering traditional Spanish houses and a thriving artistic community. Costa del Azahar begins at the Tarragona provincial border and travels south for 112km covering some beautiful beaches overlooked by orchards of olives and oranges. For this reason, it is also known as the Orange Blossom Coast. 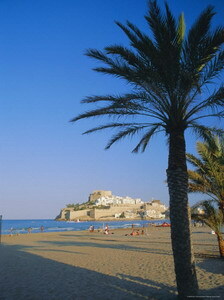 Popular coastal resorts include Peñíscola with its medieval castle that was featured in the film 'El Cid', and Sagunto offering many Roman artefacts and sites including a 2nd century Roman Amphitheatre. 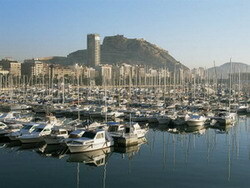 Alicante is well known on the tourism trail and a great destination for those wanting a traditional beach holiday. The weather is fantastic with hot summers and mild winters and the city offers an abundance of gardens, parks and squares from which to enjoy the relaxed atmosphere. There are many wide palm-lined avenues providing an unlimited shopping experience from the large department stores like Corte Inglés, to fashionable boutiques and souvenir shops. Every street corner in Alicante bustles with holiday activity with holidaymakers perusing the many shops selling local ceramic, marble, leather and wooden produce. Despite the worst excesses brought upon the city by package tourism, Benidorm delivers very well for the package holidaymaker. The two main beaches Playa de Poniente and the Playa de Levante are over 5km long in total and offer enough space for everyone. The bars and restaurants are in sufficient supply and with over 30 discos on offer; nightlife in Benidorm is lively to suit all tastes. The attractive Balcon del Mediterranean set in the middle of the two beaches, has spectacular views of both beaches and also its island lying just offshore. Benidorm is surrounded by mountains as high as over 1,500 metres and these keep the cooler north winds at bay to give the city warm temperatures even during the Winter months when temperatures stay mild. Just 7 kilometres down the coast lies the small town of Altea. A change from bustling Benidorm, Altea offers a traditional community with a preserved old quarter that attracts many artists because of its wonderful light. 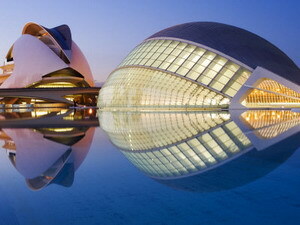 Valencia lies on the Costa del Azahar and is the third largest city in Spain. It is an industrial city with a medium-sized port, but the local government is working hard to improve the city's image to tourism. One example of this is the recent completion of the new City of Arts and Sciences Complex. Surrounding the city is the fertile plain called the Huerta where orange trees grow in abundance as does rice, which is, used for Valencia's legendary dish the paella. Most of the produce of the Huerta comes to the 1,000 colourful stalls of the modernist Mercado Central. Built in the early 20th century, it is an eight-sided iron girder and glass building which contains one of the largest markets in Europe. Well worth a visit even if you're not planning on buying anything. About the Author - Steve Greenwood invites you to visit Valencia Apartments For Rent for accommodation and holiday attractions in Alicante, Benidorm & Valencia. Visit http://www.idealrentals4u.com for accommodation and holiday information in all the regions of Spain including the Canary Islands and Balearic Islands. Surely, one of Spain's most impressive caves-Canalobre is about 24 kilometres outside the city. Hike to the top of Cabezon de Oro for a stunning view of Alicante and watch the sunset from the cliff-tops. Here you'll find everything you could possibly want to eat, from the freshest Mediterranean fish to the tastiest paella. Enjoy a glass of wine by the harbour in a modern yet traditional setting. But do make sure you have an afternoon snack because most Spanish restaurants don't open until 9.30pm. Spain's second largest pilgrimage attracts around 200,000 people every year. Early in the morning the crowd congregates for an 8km walk from the city centre of Alicante to the Monastery of the Holy Face. Alicante has its own museum dedicated to Spain's most iconic sport. Bullfighters are on a par with Hollywood celebrities in Spain. Learn all about the history and traditions at the Plaza de Toros Museum. Getting splattered by paint is probably not what you had in mind when you booked your trip to the Costa Blanca but this could be the ideal adrenaline buzz to banish that sangria-fuelled hangover. Alicante boasts one of the largest paintball arenas in the Valencia region. Instead of lazing around on the beach all day, try this fun and social activity with friends and family. It's a sport that can be enjoyed by all ages and is a fantastic way to top up your tan and stay active at the same time. Ride the Rapids and brave the Black Hole - don't miss the chance to try some of the most thrilling water rides in Europe. Aqualandia is just 30 minutes drive, north of Alicante, and makes a great day out for all the family. Grab the binoculars and don your khaki pants (or shorts in this case) for a wild safari adventure. No, this isn't Africa but Vergel Safari Park near Alicante features lions, tigers, leopards and zebras to name but a few. It's always interesting to explore new places, just ask Christopher Columbus or Marco Polo. The Island of Tabarca lies 11 miles south east of Alicante and offers real refuge with pristine waters and over 1400 hectares of marine life. Perfect for a weekend or day trip. About the Author - Aaron Hughes writes for Jet2.com, who offer cheap flights to Spain from various UK airports. 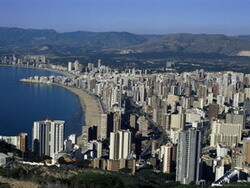 Book cheap flights to Alicante online with Jet2.com from Manchester, Leeds Bradford or Blackpool airports.